A recurrent theme in the globalization literature is that jobs and investment are being increasingly funneled away from wealthy and middle-income countries towards countries that boast large reserves of cheap labor, in particular, China. It is often argued that the failure of middle-income countries like South Africa, Mexico and Colombia to benefit from globalization rests on the inability of these countries to compete with China’s low wages. While popular, this argument doesn’t stand up to empirical scrutiny. 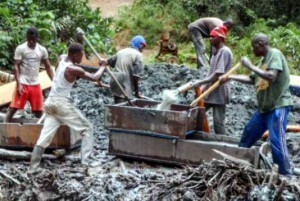 This paper will address the fallacy of cheap labor arguments, and examine the continuing relevance of Marxist theories of primitive accumulation, through a comparison of China and South Africa. It will first examine the case of China, a country considered by many to be the greatest success story in the era of globalization. China’s growth trajectory took off as it began opening up its economy and participating in export-oriented industrialization. It was able to escape the disastrous effects of structural adjustment felt by countries in Latin America and Sub-Saharan Africa by avoiding Western banks and following a gradual policy of privatization and trade liberalization. Another key difference between China and South Africa is the continuing presence in China of a large peasantry only partially separated from the means of producing is subsistence. South Africa, by contrast, has one of the longest histories of capitalist development on the African continent, and its labor force has long been fully proletarianized. Especially after the liquidation of the apartheid regime, it has been a most faithful follower of the precepts of ‘ideological globalization’ (Chase-Dunn, 1999). By comparing the developmental trajectories of these two countries, this paper sheds light on the historical roots of competitive advantage and disadvantage in economic development and at the same time challenge contemporary neo-liberal prescriptions for development. Yet, we see in the case of South Africa, that the dispossession of peasants from their land, along with their exclusion from entrepreneurial opportunities and confinement to reserves, contributed in the long run to developmental failure and economic crisis. China, on the other hand, strengthened its peasantry, which, in addition to the social institutions implemented by the Communists (housing, schools, health care), laid the groundwork for later developmental success. These observations highlight the need for a re-evaluation of long-standing assumptions about development. The paper argues that while accumulation by dispossession (primitive accumulation) might have been crucial to capitalist development in earlier periods, under present conditions it appears bad not just for the dispossessed but also for the long-term prospects of national development. In conclusion, four main points on a country’s sustainable development under the era of globalization are made by summing up the contrasting features of the southern African and the East Asian developmental experiences. This entry was posted in Social and tagged China, South Africa, work on 19/03/2018 by Mary.